The Minister of Information and Culture, Alhaji Lai Mohammed has charged members and supporters of the All Progressives Congress (APC) in Kwara State to campaign rigorously for the party across the three senatorial districts of Kwara State to ensure the party’s victory in the February 16 and March 2 general elections. 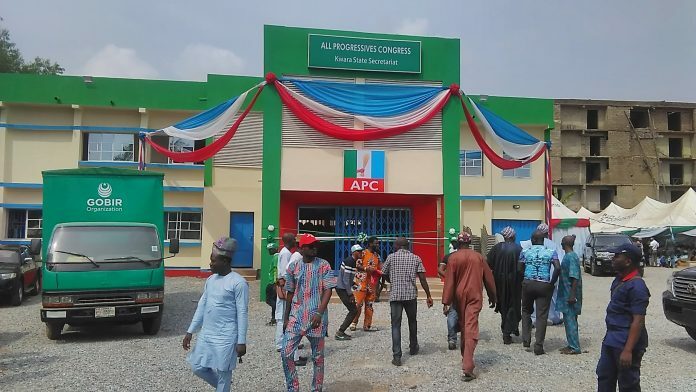 Alhaji Mohammed gave the admonition on Saturday at the official commissioning of the All Progressives Congress Party’s Secretariat donated by Gobir Organisation held at Asa road, G.R.A, Ilorin, Kwara State. The Minister, who exuded confidence about the victory of the party in the forthcoming polls, said he is very sure of landslide victory for the party across boards. Alhaji Mohammad assured that all political thugs and hooligans would be dealt with and cleared from the streets ahead of the polls, pointing out that they would all be arrested to guarantee a violence free election. He, therefore, urged the people to come out massively to cast their votes for the APC. He appealed to all members of the party to monitor their votes at the polling units and troop out enmass to work for the success of the party. Also speaking, Nigeria Ambassador to Malaysia, Ambassador Nurudeen Muhammad, charged all party’s members to return to their various senatorial districts and wards to campaign massively for the All Progressives Congress to ensure total victory in the forthcoming polls. In his remarks, the Party’s Chairman, Mr. Bashir Bolarinwa, appealed to all Party’s members to make it as part of their duties in their respective areas to retire to their various units to mobilse the people to vote for the All Progressives Congress. Mr. Bolarinwa thanked the former governorship aspirant of the party, Alhaji Lai Gobir for donating the building and vehicles for the party, pointing out that the gesture showed that the party is united and committed to its victory. He enjoined all members not to relent but to continue the mobilisation job to ensure victory for all the party’s candidates at both the state and national levels. While speaking at the programme, the former governorship aspirant of the party, Waziri Layi Gobir, whose organisation made the party secretariat donation, said the structure and vehicles were donated to the party towards ensuring the victory of all the Party’s candidates in the forthcoming polls. Alhaji Gobir noted that it is time for the youth to take over government, saying that they should not take power through violence. He appealed to all party members and supporters, particularly former governorship aspirants to forget the past, but embrace peace and love in the task of clinching victory across boards for the party.